Disney focused heavily on money to be made from streaming video content on its sites during an earnings call last week, and the company is now pairing with retail giant Target to produce a web series aimed at families preparing for a fall return to school. Back to school preparation is a big business in the US, and despite continued economic hardship, sales are predicted to be up 6.2% over last year in the sector. Likewise, Disney-branded products are a big business for retailers, commanding a higher profit when items are emblazoned with characters or logos from Disney properties like Cars or Toy Story. 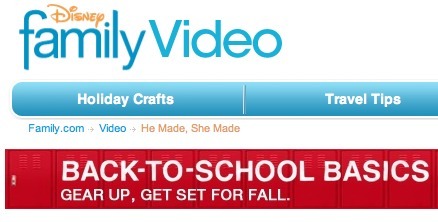 He Made, She Made is the latest online program from Disney Family and Disney Family’s FamilyFun.com featuring “every family’s Aha-inspiring guru,” Courtney Watkins. Developed in collaboration with and sponsored by Target, the program features Watkins and fellow DIY designer extraordinaire Jonathan Fong, showing you how to make budget-conscious, elementary school-friendly creations with a lot of imagination, a little elbow grease, and supplies from your friendly local neighborhood American retailing company. The series’ first few segments are available for streaming on the Disney Go site, but no information on whether the series will be continued for future retail seasons has yet been made available.